Verizon appears to be taking a page out of Google’s playbook by handing out free digital treats that can make your holiday trip on the busiest travel day of the year less painful. The mobile carrier has paired with numerous partners to declare the day before Thanksgiving (Wednesday, November 26) “Connection Day” in the U.S.
Verizon’s first big giveaway is free Wi-Fi in partnership with Boingo, Gogo, and Jet Blue. 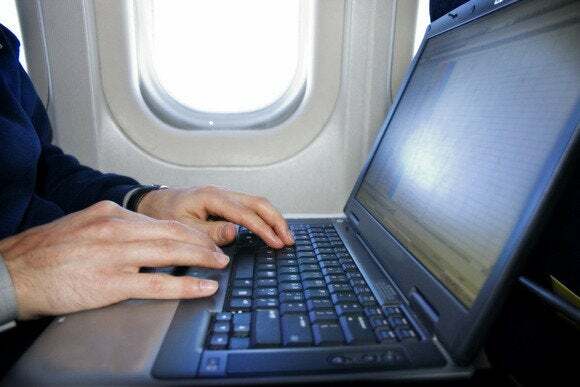 If you’re on a Jet Blue flight you can get a free Wi-Fi session between November 24 and December 24, while Boingo and Gogo are each offering one-time 30 minute free Wi-Fi sessions on the 26th—in airports and in-flight, respectively. As this is a Verizon-led promo, Verizon subscribers get an extra special gift. Any Verizon Wireless customer who signs up on the company’s Connection Day webpage will get a one-time credit of 1GB of shareable data on their account plus another 1GB of data in the next billing cycle. The impact on you on the road: As we’ll soon see, Verizon has a lot more up its sleeve than just free Wi-Fi. Several of these free, promotional giveaways end with a paid commitment. If you go for the freebies, make sure you cancel each service before the free trials are up to avoid expensive gotchas. In addition to free Wi-Fi, Verizon is also giving away free movie and TV show streaming with the Verizon FiOS Preview app. The app is supposed to go live in Google Play, but was not available at this writing. It’s unclear if an iOS FiOS Preview app is also in the works, but that seems likely as Verizon is also working with Apple. The iOS maker is going to have a special free offer inside iTunes on November 26. Condé Nast is offering free downloads of 17 different magazines such as GQ and Vanity Fair. Pandora is offering a free week of Pandora One, the Internet radio provider’s premium service. There doesn’t appear to be any further commitment after your free trial, but you may get a few ads asking you to sign up. Amazon has a few tricky deals it’s offering. You can get two free audiobooks from Audible if you sign up for a two month trial. But after that trial ends you’ll end up paying $15 per month for the full Audible service. If you’re a current Audible customer you can’t get the free downloads, but Audible will give you a $10 coupon that you must apply to your account within 60 days. You can also get a 30-day free trial of Amazon Prime with all the frills that services offers including free two-day shipping and movie and TV streaming. But you’ll pay $100 every year if you don’t cancel Prime before the trial ends. Truth be told, the free Prime trial isn’t that great because you can get that offer anytime. As for Audible, Amazon typically offers 30-day trails, not the extended 60-day free trials available via Verizon's offer. Amazon is also offering 10 free songs you can add to your Amazon music library, and 10 free apps in the Amazon App Store—if you have an Amazon account, of course. Overall, it sounds like you get a few niceties plus a whole lot of promotion from companies trying to convert you into a paying customer. It’s not clear if these promotions will automatically show up in their respective apps and services or if you have to visit Verizon’s Connection Day page to claim them. Nevertheless, as long as you set some reminders in your calendar or on Google Now, you can enjoy a few worry-free freebies on your plane ride home. Editor's note: This article was originally published on 11/12/14. This story, "Verizon offers free Wi-Fi, mobile data, and more to weary Thanksgiving travelers" was originally published by PCWorld.